Steer clear of stale workout routines and try a fun, challenging preprogrammed treadmill workout. 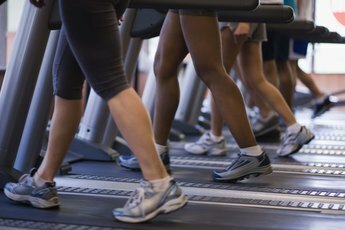 Treadmills make fitting a great workout into your day easy and convenient; they're also straightforward and highly effective. Unfortunately, some exercise enthusiasts become bored with a stale treadmill routine and lose sight of the end goal -- getting into great shape and having fun while doing it. If you're ready for a challenge, stay away from the "Quick Start" button on the treadmill and try one of the best preprogrammed treadmill workouts that are guaranteed to make you drip sweat, shed pounds, build muscle and feel great. 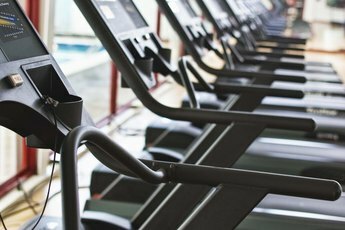 Most preprogrammed treadmills have an interval-training option that will get your heart rate up and keep boredom at bay. Intervals are among the best preprogrammed workouts for elevating your heart rate and burning calories. During an average 30-minute interval workout, your treadmill will automatically adjust speeds to simulate walking, jogging and running. 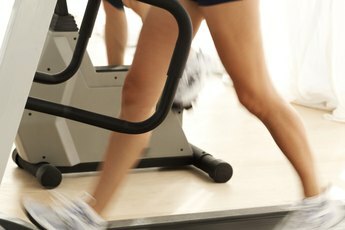 Some treadmills split the interval workout into three segments, while others will cycle through the walking, jogging and running intervals several times. One preprogrammed treadmill program that'll make you break a sweat is hill training. This program automatically adjusts the treadmill's incline to simulate running up and down hills. Hill training can be very challenging, so for beginners, select the easier option for this program if possible. For about half an hour, you'll run at a consistent speed up and down a number of hills, most of which vary in size. This workout is perfect for toning your legs, working your behind and burning calories. Cross-country programs on a treadmill are designed to provide a runner with a more realistic "terrain," simulating flat roads, small hills and larger climbs. Typically, a treadmill's preprogrammed cross-country workout is set for a predetermined amount of time, but most machines allow you to change the end-goal to a set distance. For example, you can train to run for a half hour throughout the cross-country program, or you can choose to run for 5 miles -- no matter the time. Regardless, the workout provides a challenging and dynamic alternative to straight, flat runs on the treadmill. 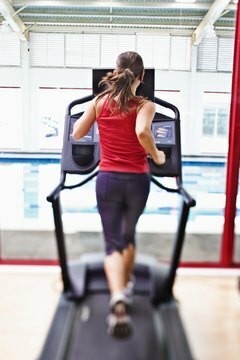 Heart rate programs on the treadmill allow a runner to set a target heart rate. Adjusted to the incline and speed, the machine is able to maintain your heart rate within a few beats per minute. These programs adjust the incline and speed to maintain your heart rate within two beats per minute of the target heart rate while you exercise. By holding onto grips that measure your heart rate, the machine can ensure you stay within a healthy heart rate range. According to the American Heart Association, women in their 20s should shoot for a heart rate of 100 to 170 beats per minute, with a maximum heart rate of 200. Women in their 30s should aim for a heart rate of 95 to 162 beats per minute, with a maximum heart rate of 190.